Editorial note: Business Insider will name its 2017 Car of the Year on November 14, based on 15 finalists. Each day this week, we’re taking another look at the five vehicles that were runners-up. So far, we’ve revealed the Acura TLX A-Spec and the 2018 McLaren 720S. Now it’s time for the double threat of the Lexus LC 500 and LC 500h. Lexus has served up not one but two flavours of its two-door sports car. We’re not talking supercars here, but these are an astonishing dynamic duo. The LC 500 is old school, with a big V8 under the hood; the LC 500h is like a Prius gone mad. Lexus decided to reinvent the sports coupé at a time when SUVs are all the rage, and there’s some serious boldness in that. But Lexus, not exactly know for bold moves, didn’t just do it once. 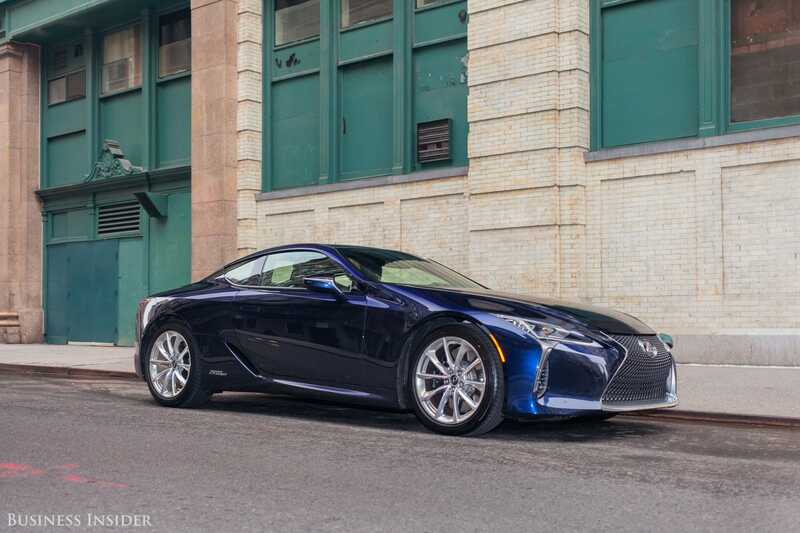 Instead, Lexus doubled down with a pair of two-doors: the LC 500, with its stonking raw power; and the LC 500h, with its clever hybrid drivetrain. We were lucky enough to sample both, close together. And we were equally impressed, but in different ways. When you think of hybrids, you think of Toyota. The Prius reset expectations for what consumers could expect from fuel-economy and emissions when it arrived on the scene nearly 20 years ago. Since then, Toyota has expanded its hybrid offerings, taking the tech out of the familiar Prius form and installing it in sedans and SUVs. 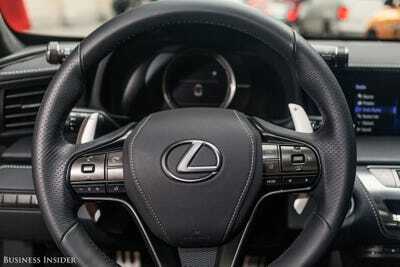 Now a version of the system has been dropped into a high-performance Lexus sports car, the LC 500h. It wasn’t a simple process, but ultimately, it was worth it. Lexus, Toyota’s luxury division, sells two versions of the LC 500: one with a big V8 under the hood, and the 500h variation we’re considering here. With the big-motor LC, you get a 10-speed automatic (with manual mode) and a straightforward linkage between gears and engine, in a rear-whee-drive grand-touring platform. With the 500h, you get a tricky double transmission, two electric motors, and a smaller but still potent V6 engine. In both cases, you get a car that literally stopped traffic twice when we borrowed them. Yes, the LC 500/500h is a good-looking car. Possibly the best-looking Lexus money can buy. Our 500h test car tipped the cost scales at well over $US100,000, but the base vehicle is a mere $US96,000 and change (the LC 500 is $US92,000). Here’s what we thought. Photos by Hollis Johnson unless otherwise indicated. The LC 500h landed in all its shimmering hybrid two-door glory near our offices in Manhattan. We didn't initially think the looks were particularly show-stopping, but EVERY SINGLE PERSON WHO WALKED BY begged to differ. The only vehicle that garnered more attention of late was our 2016 Car of the Year, the Acura NSX. 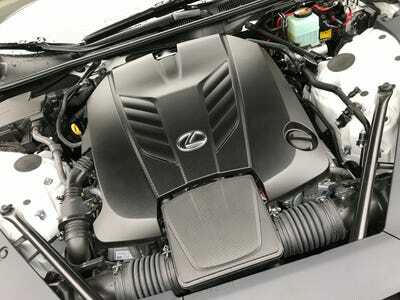 The controversial Lexus 'spindle' grille. It works on some vehicles, such as the LC and the Lexus SUVs, but it's less successful on the brand's sedans. 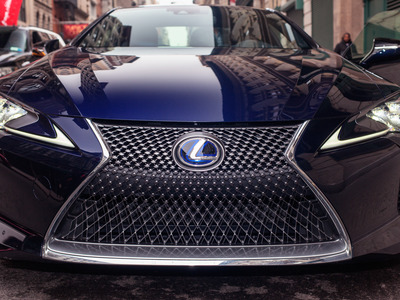 Grille, headlights, and Lexus badge are all in proportion for the LC. ... widening to a pair of athletic rear haunches and a pair of rectangular exhaust pipes. The LC 500h might be a hybrid, but its looks get you coming and going. Big old brake calipers and discs provide the stopping power. The LC 500h is a hefty car, at almost 4,500 lbs. With a 0-60 mph time of just over five seconds, this machine is quick without being blisteringly fast. But the weight means that solid brakes are essential. Bottom line is that what we have here is a proper GT, powerful but also capable of comfortable cruising. The dark leather interior provides abundant comfort, if severely limited space. The driver and passenger will be relatively content, and the seats are supportive and well bolstered. This steering wheel is fantastic. Leather-wrapped, perforated, and with nice big shifting paddles. As you can see, the overall vibe in here is rich and subdued, with the leather counterpointed by brushed-metal trim. Very sophisticated. Note the grab handle for the passenger. Yes, there's enough performance bottled up in the LC 500h to induce grabbing hold of something under certain circumstances. 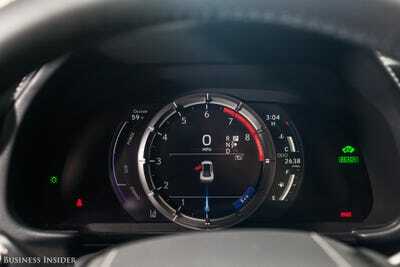 The digital instrument cluster changes depending on which drive mode you're in. You've got Comfort, Normal, Sport, and Sport Plus at your disposal. 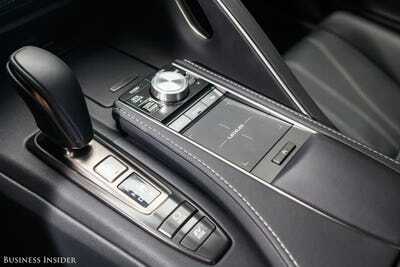 You choose using a small drive move selector that juts from the instrument panel. As sports-car trunks go, the LC 500h's isn't actually too bad. In classic GT fashion, there's room in here for a fashionable couple's weekend gear. 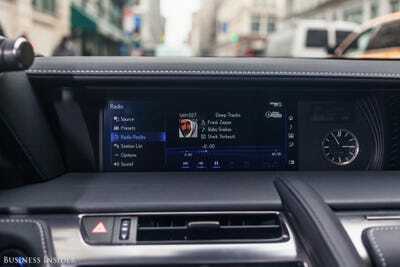 Lexus' infotainment system for the LC 500h is functional and comes with all the modern touches, but it's not well-loved. 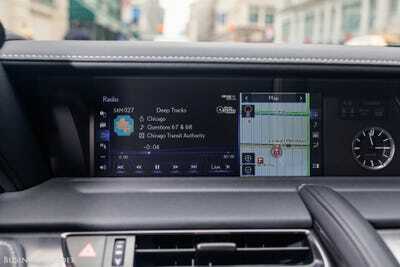 You have navigation, multiple audio options, voice activation, Bluetooth connectivity and AUX/USB ports. But the know-button-trackpad combo is difficult to use. The infotainment screen is modest in size. But that's no knock -- screen are typically not huge on sports cars. As with many systems these days, the view can be customised to display multiple types of information -- in this case, audio and navigation. 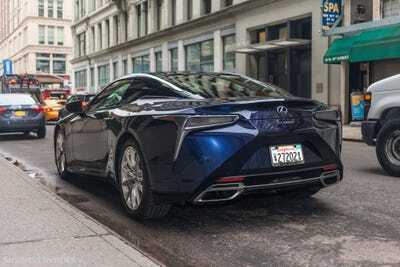 Apart from the styling, which was admired by everyone we encountered who looked at the car, the most interesting aspect of the LC 500h is the hybrid-electric drivetrain and its exotic transmission. What we have here is effectively a Prius-like gas-electric hybrid setup, but with a much more powerful gas engine and a transmission that is quite unlike the Prius' oft-maligned continuously variable unit. The motor is a 295-horsepower, 3.5-litre V6 -- in and of itself, a pretty tasty powerplant, just not quite up to snuff an exciting grand-touring car such as the LC 500h. 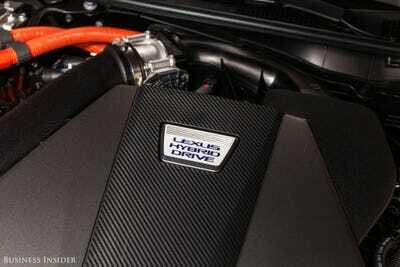 A pair of electric motors bumps the output to 354 hp (with power stored in a lithium-ion battery). And then comes the complicated transmission. 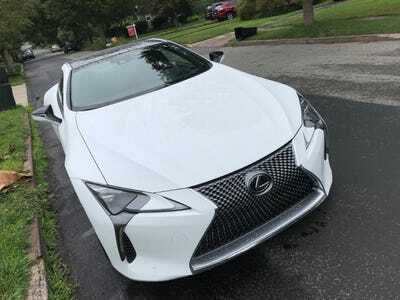 It's effectively a CVT combined with a more familiar four-speed gearbox, two transmissions for the price of one (the LC 500h, by the way, stickers for over $US4,000 more than the LC 500). I've experienced the general idea in other vehicles, and the concept is to overcome the balky torque delivery of a CVT and provide the spirited driving dynamics that enthusiasts crave from conventional geared transmissions, but without clonking the hybrid fuel economy. The best way to think about it is that the LC 500h can be driven like a car with a normal transmission, either in full auto or manual mode. Especially in manual mode, you want the power to be delivered in a crisp manner, without any lag. 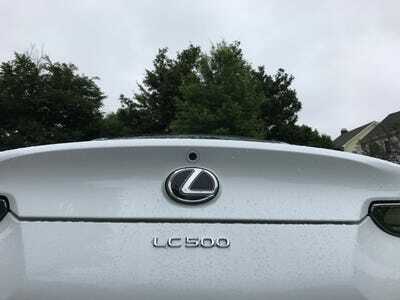 What the LC 500h's system does is provide the torque required when the driver wants it, until the driver doesn't want it, at which point the LC 500h goes back to being a Prius in nature -- until the driver wants torque again. Yes, there's a lot of engineering behind all this. But the bottom line is that it's tremendous in practice. That sort of buzzy, always tapped-out CVT feeling that Prius owners such as myself know and love is never in evidence. So what's the verdict on the LC 500h? The LC 500h continues my enthusiasm for Toyota's hybrid systems, from the Prius through the Lexus version of that car, the CT 200h, to this near-halo vehicle, which is more or less intended to give the BMW i8 a run for its money without tripping into supercar territory. The DNA of the LC 500h is pure grand tourer, a coupé that's optimised for stylish runs to a second home or a snazzy resort. The thrill of arrival is partly supplanted by the joy of getting there. Yes, you can opt for the stonking V8 LC 500, with its additional oomph and engine growl (more on that in a moment). But as with many high-powered performance cars these days, it will be hard to find anywhere to dive deeply into all that horsepower. The LC 500h offers the same package, but with tasty hybrid fuel-economy and electrically augmented pop when accelerating. Yes, the hybrid system adds cost, but at this level, that's sort of academic. In exchange for a few grand extra, you acquire some exceptional technology and can spend hours trying to figure out how the transmission actually works to regale friends with tales of Lexus engineering prowess. 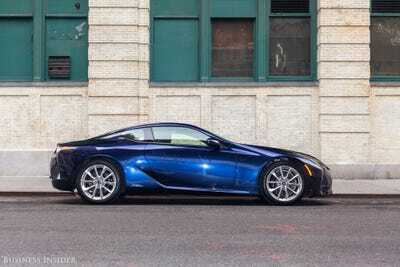 Or just ignore the details and enjoy the LC 500h's ecologically sensitive voodoo. The LC 500h isn't quite as comfy as the Acura NSX, perhaps the easiest-to-live-with mid-engine supercar on Earth (and our 2016 BI Car of the Year). 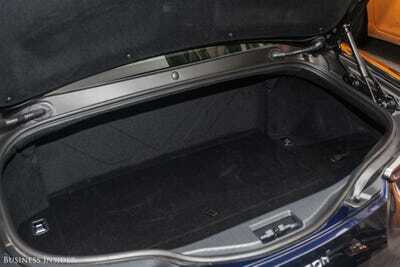 But the LC 500h also has a back seat and trunk. And it's abundantly comfortable. I expected the LC 500 to be an absolute kick to drive. But I also felt that I got into more of what the LC 500h has to give. The entire combination is ferociously suave, sort of like a high-tech Japanese Aston Martin. This is an eminently satisfying rear-wheel-drive sports car that intensifies every fundamental. Acceleration is brisk. Handling, thanks to the carefully composed suspension, is exceptional. Steering is communicative without being a chore. The brakes are outstanding. Put it all together and you've got a car that's ready to give everything it's got when called upon but is happy to return to poke-around-town mode when the fun has ended. That might sound boring, or like a machine that wants to have it both ways and could be compromised accordingly. 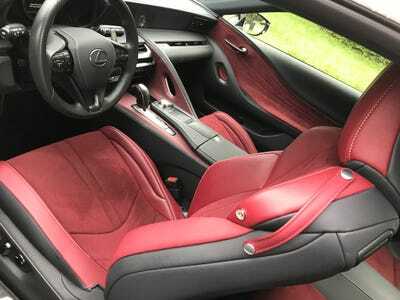 But the LC 500h isn't boring at all, and at no time did the whiff of compromise emanate from it. The car is quite simply superb. Sure, the LC 500 is objectively more machine. But the LC 500h has a secret weapon, called miles-per-gallon. According to the EPA, it's 26 city/35 highway/30 combined. For a car with this much performance and style, that's astonishing. On to the LC 500! Our test car was a well-optioned, pre-production version of the $US92,000 base LC 500. Inside and out, it was stylish and luxurious. The LC 500h was a real traffic stopper in shimmery metallic blue, and the icy white LC 500 continued that trend. It was one of the most looked-at cars we have sampled in recent months, exceeded only by something like the Acura NSX supercar. As with th 500h, the LC 500 just seemed to get all the proportions right. 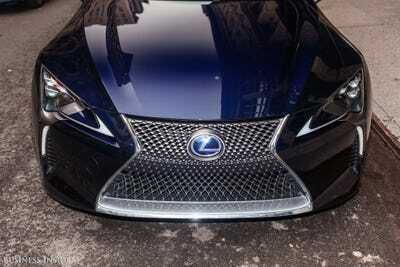 Even Lexus' controversial 'spindle' grille appears fetching as the prime feature of the car's fascia. The current design vocabulary Lexus is using is heavy on folded shapes and articulated edges, and on some vehicles (I'm looking at you, RX SUV) the approach can seem excessive. But on the LC 500, barely restrained excess is the whole point, and here all the swoops and slashes and drama come together effectively. The interior is arguably even better, a sleek realm of tautly bolstering leather seats and all manner of Alcantara swathing. It feels spectacularly premium without even a hint of the stodginess or borderline midlife crisis vibe found in other upscale GT competitors. The back seats are, of course, not really suitable for grownups, although I did transport an adult passenger from Manhattan to New Jersey, with no major complaints. Can we talk about the motor? 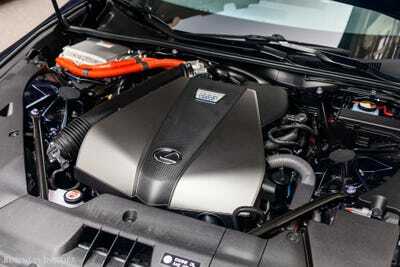 The heart of the LC 500 is, of course, a 5.0-litre, 471-horsepower V8, delivering 398 pound-feet of torque and a Lexus-claimed 0-60 mph time of 4.4 seconds. That's juicy fast and impressive given the LC 500's bulk, which is about one NFL defensive lineman above 4,000 lbs. On a roughly 230-mile round trip test-drive from the Garden State to Connecticut and back, I didn't have a lot of opportunities to duck and dive into corners (there was some of that), but I certainly had a chance to pilot the LC 500 and that excellent V8 in a straight line. One of the best things about a big V8 is that you get this 'bottomless well of power' effect: you're roaring along, but you can always roar more. This is very relaxing, knowing that you can just tap the throttle and summon more puissance, literally on demand. This is precisely what you want from a GT car: the Grand Tour entails parkways, highways, freeways, motorways -- all the many ways that cars can drive on -- blended with some scenic twists and turns. 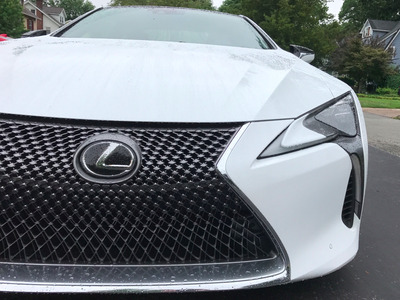 On this front, the LC 500 is magnificent. It's different from the LC 500h, which is natural given that the driving dynamics of a hybrid vary. In the case of the LC 500, they vary a lot, but not so much with the handling and the vehicle's composure, more so with the powertrain. You've got a rear-wheel-drive car in both cases, but the LC 500 has a large gas-only engine with a 10-speed transmission that can deliver decent fuel economy. 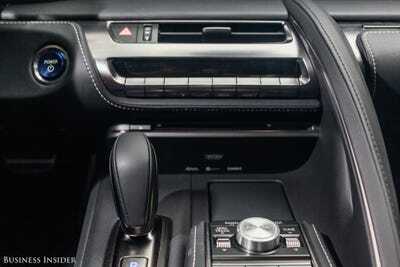 It also has an Eco mode to go along with a Comfort mode, as well as Sport and Sport Plus modes that when combined with the paddle-shifters allow the driver to take control. Lexus has set about changing minds and capturing heats with its enthusiast offerings, and somewhat shockingly, it's succeeding. 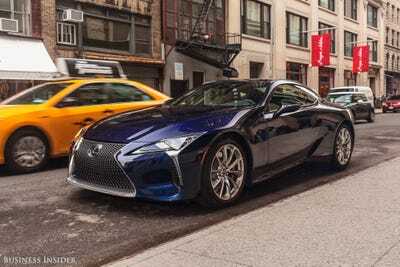 Memories of the legendary LFA supercar linger strongly, and while some of the Lexus' F-Sport products haven't been quite as good as we might have hoped, the LC 500 is a generally brilliant piece of engineering. The market for such machines is small but significant, as far as branding, influence, and direction are concerned. The LC 500 is a 'talker' -- a car whose reputation will increasingly precede it. And a very good reputation it will be: this might be the best high-performance car Lexus has ever built. Together with the LC 500h, what we have here is an epic pair of astounding machines.